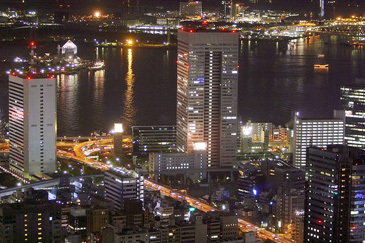 Nightly view of Toshiba Corporation Headquarters in Tokyo and its vicinity seen from the Tokyo Tower. When an image is often a spinning burst of soft and bright colors like a freeze frame sliced from a kaleidoscope, where you hear hip-hop to bebop music from gentle to 140 beats per minute transfused form various eras and styles, where it’s always the right time to ride a brightly green microbus to a watch the whales, and where the sun hardly ever sets. Welcome to the early age hippie-land as here colors are so wildly greenish and so Jello-yellow while images are carefully designed to not only touch gently your soul, but also firmly your wallet. This type of mask is all around us from consumer-packaged goods to all other sectors. Once exclusive to soda pop or soap selling this style with overly slip-n-slide and touchy feely names a very large number of heavy industrial giants from mega petrochemicals to global mining companies have adopted such themes to fit eco friendly trends. Most of the time such imagery does get attention, but high density of this motif makes the imagery overlapping and forgetful unless it is in your face all the time and for this reason alone this it provides the largest billing share to the global ad marketing services. Identifier: generic and forgetful names wrapped in logo themes. Evaluation: appears easy and fun to play but works only with unlimited ad budgets. Caution: How do these identities fit with ever expanding universe of global audience and how truly solid are their name identities and trademarks? references. Evaluation: how to balance the image with delivery of quality and promise. Caution: the increased dilution of classy ideas with mixed skills under flashier websites. Here, image, name and branding things are mouse driven, what you see is not what you get. This image is here today and gone tomorrow. Ingenuity and stupidity are both displayed in a simultaneous interaction. Just don’t blink too fast. Great ideas, packaged as silly brands and named in the most ridiculous fashion are the standard. It works but extremely rarely as the subtly and cuteness before deciphered in the marketplace first kills the cash flow. Colors are mostly out of control, total imagery and business model is translucent while corporate name identity is transient. As technology changes, so do the names. There is constant surgery to an existing name, primarily to accommodate trademark conflicts and secondly because the original name never matched the core business. You can’t ignore the most twisted or irrelevant logos and colors wrapped around intertwined and multiple meaning names, often as a result of long term surgery to any mask. The glory of the past and dynamic mergers and acquisition creates a disconnected train of iconic engines each pulling in a different direction. new mask must be deeply intelligent processes otherwise a change may lead into something totally new but its weird concoction would park the image in an undesired carnival parade. Most are too embarrassed to admit such fiascoes or to decide to re-change all over again. There are millions of other organizations too that do not place any importance to image and name identity at all. Welcome to the largest group of these faceless empires on this planet. Here nothing makes a difference. What name? What image? What identity? Like a humongous school project the bosses run the operation by the seat of the pants without any global identity blueprint, always chasing profit in panic and often in the dark but constantly complaining about lack of attention given to them in the markets. For every well defined image and identity there are thousands of such faceless organizations. The meltdown and commoditization are both critical wake-up calls for this sector. These particular masks represent the last century thinking where such image solutions presented by creative agencies of the period molded these types of businesses imagery. Now in a post-meltdown and hyper accelerated global image shifting world most would appear to be almost misfit. No matter what, keeping an open mind is the best way to measure the cost of keeping the current mask, identity and layers of imagery. You can bring in brand new special knowledge in your organization on how to achieve the right makeover, but please do not confuse this with the traditional logo-slogan dependant rebranding processes. Image makeovers, in a post meltdown adjustment are extremely critical today, but first thing you need is a real mirror.